Smartphone screen sizes increased considerably in the last years, so much that manufacturers are now releasing smartphones that are almost as large as some tablets (this making the term phablet rather unnecessary). Obviously, this is becoming a problem for some users. Well, leave it to the Japanese to solve it. Folks in Japan can now buy a thumb-shaped stylus that’s especially designed for smartphones, extending your finger by 15mm (0.59 inches). That might not seem like much, but it should help if you often find yourself striving to reach that far-left corner of your humongous screen. 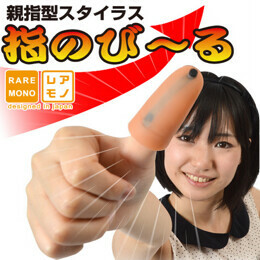 The thumb stylus weighs 11 grams, is made out of silicon, and costs 1,480 JPY in Japan (about $15). It’s certainly a weird accessory, but, unlike some products that promise to enlarge your... uhm, not your finger, this may actually be useful. We don’t see it available outside Japan, though, so you might not have the chance to buy one anytime soon. Definitely. Do they have a middle finger option? The problem is you can't hold your Note 3 and use the stylus at the same time with one hand. Not sure if creative or crazy. I'm patiently waiting for the tentacle enlarger. japan will take over the world!